Out of respect of the winner of the very first race of the Moto2 series who lost his life at Misano, I made this vector art in about 5 days, which is available to download for free. With the vector art you can print high detail without it being pixelated. You can print it on extreme sizes like a1 or even bigger. You can view and download the files below from Scribd. 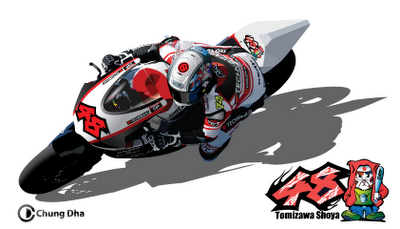 You can print it out as a big poster, photo or on a Tshirt as tribute to Shoya Tomizawa. Please do not use this vector art for any commercial use like selling posters or shirts with it. RIP Shoya Tomizawa winner of the very first race of the Moto2 series, condolences to the family , friends and team. In a short time he showed his potential to the world that he can be in front racing, winning, takings pole positions and more. He would had been a great racer in the Motogp series.